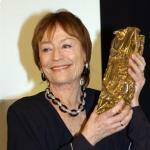 French actress and 1950s cinematic icon Annie Girardot died on Monday aged 79 after a long struggle with Alzheimer's. She was 79. "Today French cinema is mourning one of its most likeable, most distinguished and most remarkable people," Culture Minister Frederic Mitterrand told reporters. Throughout her 120-film career, she became a symbol of the feminist movement in France, thanks to her everyday woman image, far from the pouting pin-up Brigitte Bardot. Coming from modest backgrounds - she trained as a nurse before becoming a stage actress - she used to claim that she has never been 'a velvety star' : 'I have always gone to the market myself, done my shopping, my housework'. Her genuine unpretentiousness and touching sensitivety may go some way to explain her enormous fan-base. She made her name in 1969 starring as a prostitute in Luchino Visconti's 1960s cult "Rocco and his Brothers", and then won a French Cesar award for best actress for her role as an overworked doctor, abandoned by both husband and lover, in the 1976 film "Dr Francoise Gailland". After several years' absence from the screen due to personal problems and wrong film choices, she made a successful come-back in the 1990s with "Les Miserables". It earned her a best supporting actress Cesar, and so did her role as Isabelle Huppert's tyrannical mother in the 2002 Michael Haneke film "The Piano Teacher". She moved the public to tears during the 1996 Award Ceremony by declaring : 'I don't know if French cinema has been missing me, but I've been missing French cinema a lot'. As a tribute, Jean Cocteau's words seem most apt: he described Girardot as "the most beautiful post-war dramatic temperament", and film director Claude Lelouch, who shot "Life for Life" with her in 1967, who called Girardot "French cinema's greatest post-war actress". Fanny Ardant, Nathalie Baye etc. Girardot, who began her film career in the 1950s with such titles as Maigret tend un piege, with Jean Gabin, was famously ignored by the petulant schoolboys who did their best to de-rail the French Industry in the late 50s/early 60s and was probably thankful - at least she should have been - not to be tarred with the 'nouvelle vague' brush. Ironically her breakout role was in the Italian film Rocco and his brothers with Alain Delon. She worked for Carne in Three Rooms in Manhattan in 1965 and tended to divide her work between stage and screen adding lustre to both mediums as her two Molieres and three Cesars testify. She was in the finest tradition of French actresses and will be sorely missed.